By buying this product you can collect up to 4 loyalty points. Your cart will total 4 loyalty points that can be converted into a voucher of $1.60. Don't fall for cheap Chinese fakes...real deal only here! VERY heavy, unbelievable level of quality! Who doesn't know the situation when you are working on your laptop or playing video games with a nice Shisha. Problem is that you can't hold the hose and play/work at the same time. All this has now an end, with the Gamer Hose you can now smoke hands-free. Germany did it again :). It includes a glass mouthpiece, with a medical grade silicone hose with high flexibility and V2A stainless steel core. 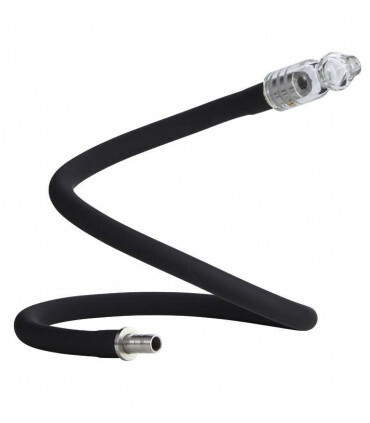 It easily connects to your existing silicone hose and lays around your neck (see picture). No rusting, easy to clean. Patented by Dschinni® Germany. Silicone hose needed! Read more about the Gamer Hose here!